Dual Agency Should Be Illegal! | My Buyer Broker Advocate! Dual Agency Should Be Illegal! This is not Real Estate for Dummies. But, it probably should be. The basic definition of dual agency is “The same real estate agent is representing both buyer and seller in the same transaction”. Dual agency is the single worst issue involved in real estate. The average “Joe” out of the street easily understands that dual agency is WRONG. This seems like common sense to the regular guy. So, why can’t the politicians and many real estate agents & brokers understand this simple terrible concept? The main reason why dual agency exists is because of the glorious MOOLAH. Real estate brokers and agents have a huge financial incentive to be involved in a dual agency transaction at the detriment of their buyer or seller. Dual agency has no benefits to protect the consumer (buyer or seller). One of the simplest and best examples that I’ve ever read about the problems of dual agency actually came from a traditional real estate agent (Matt Difanis) in Illinois and not an Exclusive Buyer Agent. A few years back, Matt had a sent this letter to the Realtor Magazine. Here is another real simple definition; agency is when a real estate broker discloses “who” & “how” they are going to represent a buyer or seller. Home buyers need to STOP spending all their time on the Internet looking at pretty pictures of potential homes and START spending more time fully understanding all types of agency (dual, single, transactional, limited or designated). Understanding agency is definitely not the most exciting part of the home buying process. As a matter of fact, it is down right boring. But, PLEASE, PLEASE, PLEASE; before you start down the path of buying a home make sure you spend time fully researching everything. As with many major financial decisions (car, home, vacation, etc.) most of us end up rationalizing decisions based on emotion, don’t make a decision based on emotion!! Non-disclosed dual agency is ILLEGAL in all 50 states. But, only a few states have made (disclosed) dual agency illegal. 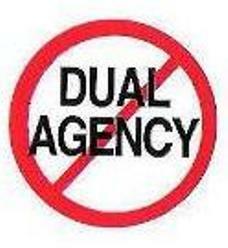 Dual agency should be”outlawed” and made illegal in all 50 states. If you are a buyer or seller involved in a dual agency transaction and you don’t completely understand dual agency than you should immediately contact or RUN to your nearest real estate attorney. about my apartment for sale..no mention whatsoever…ever..until my faithful doorman of forty years mentioned this detail to me………i reported my agent to the Licensing of RE in Albany…..so what …felt very bamboozled.. Double Agenting…….Sleeping with the Enemy….